Our back yard is the smallest yard in the history of terraced housing in old mill towns. It has to be. There isn't enough room to swing a ladybird once you've taken into account the space used up by the two wheelie bins, the makeshift shed that houses chopped wood for the log burner, the plastic garden table and chairs and the rusting barbecue. So I haven't really invested much time into making it look 'nice' out there. A while back I sent off for the BBC Dig In free seeds, thinking that I'd donate them to my son's primary school. They duly arrived, I sent him off to school with the envelope and he returned with it saying that they school had been donated loads of seeds and they couldn't use them all. Since then (approximately 9 weeks) the envelope of seeds has sat on the desk in the front room, waiting for someone to do something with them. I was bored last Saturday so I was wandering round the kitchen, opening and closing cupboards, looking for something to eat do and saw the stash of empty take-away cartons that I keep for no apparent reason because they will always be useful for something. There was also a random bag of compost in the yard from when I'd attempted hanging baskets last year. Yes, you've got it... I put one and one and one together and spent the next hour working out how to sort all this out without the most basic of garden tools - not even a trowel. 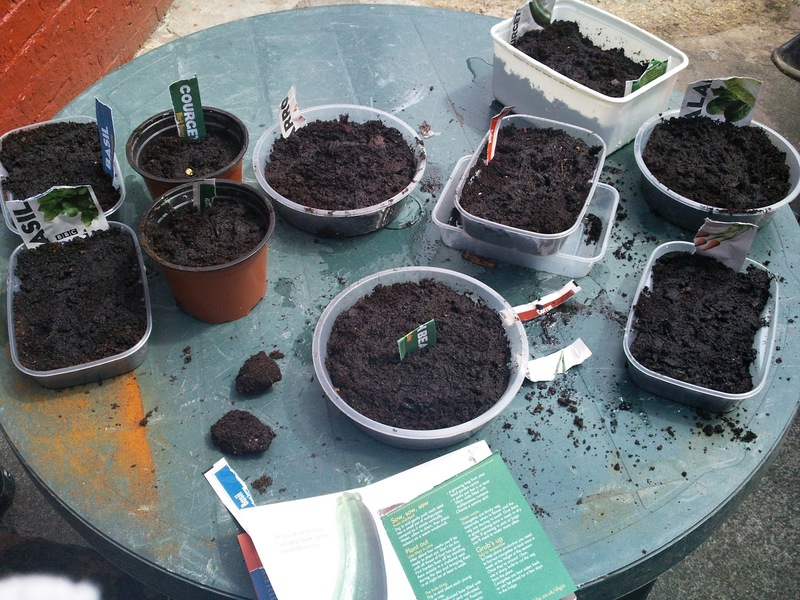 Ah well, ever resourceful, and with the help of the little instruction booklet provided with the packs of seeds, the least green-fingered person in the whole of Lancashire has managed to plant French Beans, Baby Carrots, Salad Leaves, Courgettes and Basil. I've also got the most limited window sill space ever so three pots are balanced on the kitchen window sill and the rest on the outer sill of the middle lounge (sheltered in the yard). Oh, and they have started growing!! I'm SO excited... like a kid who sees their cress growing out of the top of the egg shell for the first time. It said on the packet that germination (get me with the correct terminology) would occur between two and four weeks but it looks like I'm going to have to do some re-potting (there I go again) on Saturday. And of course I know it's a children's initiative but I'm setting an example, aren't I?